Freshly Spun Bag's Made To Order. 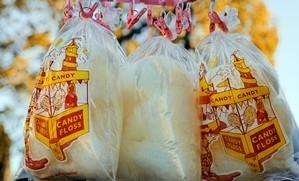 A sealed bag of freshly spun candy floss / cotton candy , ideal for your fete, gala, wedding, corporate or community event. Highly visible Bag's to draw attention. Price Inc Free Local Delivery within 5 miles ofKettering.